Add to calendar 2018-12-15 17:30:00 2018-12-15 20:30:00 America/Los_Angeles 2018 Lighted Boat Parade A Marin County holiday tradition since 1966!Holiday boat parades on the San Rafael Canal have been helping Marin families celebrate for more than 50 years. Each year, thousands of spectators line the route to admire and shout holiday greetings to dozens of beautifully decorated, brightly lit boats as they pass.This year the parade will again be led by Santa, aboard the San Rafael Police Boat the “Mission City.” He will be followed by boats filled with Holiday revelers. Parade watchers along both shores will exchange season’s greetings with boats, many of which will carry singers and be playing music.The parade traces its roots to 1966, when the San Rafael Chamber of Commerce sponsored a daytime parade of 58 boats. It swelled to close to 80 boats in the 1980’s. Car traffic slowed on Highway 101, and along Third Street and Point San Pedro Road. This year’s parade is organized by the Marin Yacht Club, The Loch Lomond Yacht Club, the San Rafael Yacht Club and the Classic Yacht Association. The popular parade also attracts many individual boats from neighboring yacht clubs and communities throughout the Bay Area.The beneficiary of this year’s parade is the San Rafael Santa Cop Program, sponsored by the San Rafael Police & Fire Departments, the San Rafael Police & Fire Associations, and International Footprint Association Chapter 15. Their aim is to make the holidays a little happier for the many children who have no control over their own circumstances. Santa Cop also strives to create a positive bond between the Police, Fire and families that are part of the community they serve. Red Barrels for toy collection will be at all San Rafael Fire Stations, including Marinwood Fire, San Rafael City Hall and local businesses which can be found on the website: www.sanrafaelsantacop.org. If you would like to help with this year’s Santa Cop Program, contact the Santa Cop Hotline at 415- 456-2685 or Santa Cop Email at srsantacop@gmail.com.The San Rafael Canal is an important waterway that helps define the City of San Rafael. It is vital for commerce, navigation and recreation. It serves as a flood control mechanism, and is used by the police and fire departments for rescue and fire-fighting. The annual boat parade is another benefit the community derives from the maintenance of the canal for public safety, residential, commercial, and recreational purposes. For more information about supporting the Canal, contact Nadine Urciuoli, at nadine@helmutsmarine.com.Rain or shine -- The parade begins as boats converge at the east end of the San Rafael Canal, across from Pickleweed Park at 5:30 p.m. The San Rafael police boat “Mission City” will emerge from the Marin Yacht Club marina to lead the parade. Boats will proceed east along the Canal to the Turning Basin behind Montecito Shopping Center, and back to Pickleweed Park.Dress warmly and share in this wonderful, free, community holiday celebration. All lighted boats are welcome. Boats should register at the Marin Yacht Club, 415-453-9366. Boats less than 25 feet in length, Kayaks and SUP boards are discouraged due to the high boat traffic, and the visibility and handling limitations of the larger boats at night. This year the parade will again be led by Santa, aboard the San Rafael Police Boat the “Mission City.” He will be followed by boats filled with Holiday revelers. Parade watchers along both shores will exchange season’s greetings with boats, many of which will carry singers and be playing music. The parade traces its roots to 1966, when the San Rafael Chamber of Commerce sponsored a daytime parade of 58 boats. It swelled to close to 80 boats in the 1980’s. Car traffic slowed on Highway 101, and along Third Street and Point San Pedro Road. This year’s parade is organized by the Marin Yacht Club, The Loch Lomond Yacht Club, the San Rafael Yacht Club and the Classic Yacht Association. The popular parade also attracts many individual boats from neighboring yacht clubs and communities throughout the Bay Area. The beneficiary of this year’s parade is the San Rafael Santa Cop Program, sponsored by the San Rafael Police & Fire Departments, the San Rafael Police & Fire Associations, and International Footprint Association Chapter 15. Their aim is to make the holidays a little happier for the many children who have no control over their own circumstances. Santa Cop also strives to create a positive bond between the Police, Fire and families that are part of the community they serve. Red Barrels for toy collection will be at all San Rafael Fire Stations, including Marinwood Fire, San Rafael City Hall and local businesses which can be found on the website: www.sanrafaelsantacop.org. If you would like to help with this year’s Santa Cop Program, contact the Santa Cop Hotline at 415- 456-2685 or Santa Cop Email at srsantacop@gmail.com. The San Rafael Canal is an important waterway that helps define the City of San Rafael. It is vital for commerce, navigation and recreation. It serves as a flood control mechanism, and is used by the police and fire departments for rescue and fire-fighting. The annual boat parade is another benefit the community derives from the maintenance of the canal for public safety, residential, commercial, and recreational purposes. For more information about supporting the Canal, contact Nadine Urciuoli, at nadine@helmutsmarine.com. 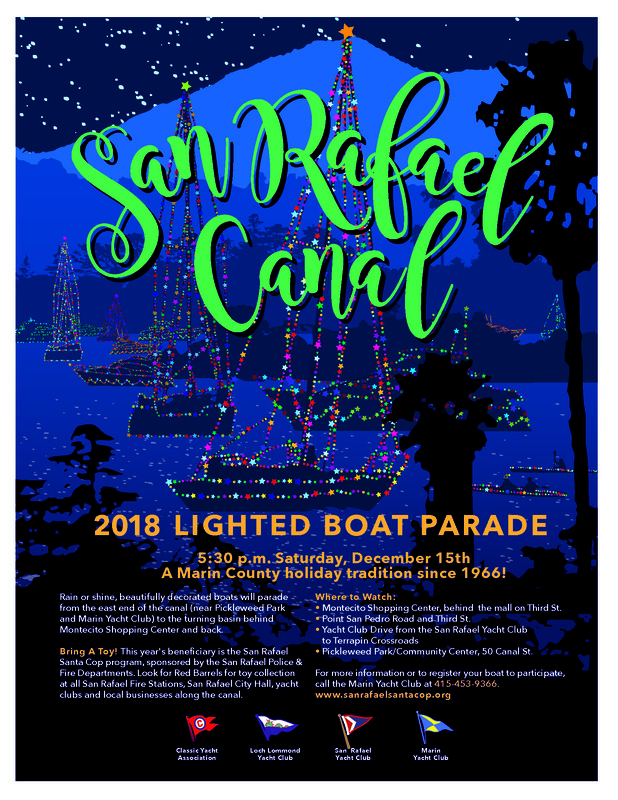 Rain or shine — The parade begins as boats converge at the east end of the San Rafael Canal, across from Pickleweed Park at 5:30 p.m. The San Rafael police boat “Mission City” will emerge from the Marin Yacht Club marina to lead the parade. Boats will proceed east along the Canal to the Turning Basin behind Montecito Shopping Center, and back to Pickleweed Park. Dress warmly and share in this wonderful, free, community holiday celebration.